Yesterday early, early in the morning persistent ringing of my phone woke me up. Who can be at 5.30 am ? Still sleepy I hardly recognized excited voice of my neighbor: Tanja, I just come back from night fishing, with your favorite monkfish,do you want it? Vauu, that news woke me up in a second, of course dear, thank you very much!!! 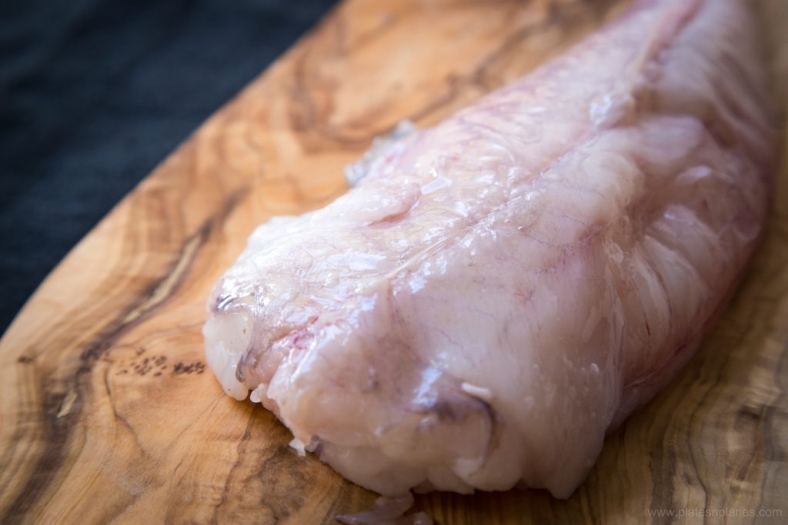 The raw monkfish fillets in carpaccio are especially delicious. But today I’ll prepare it on the way – cooked in white vine sauce and serve it with green tagliatelle. 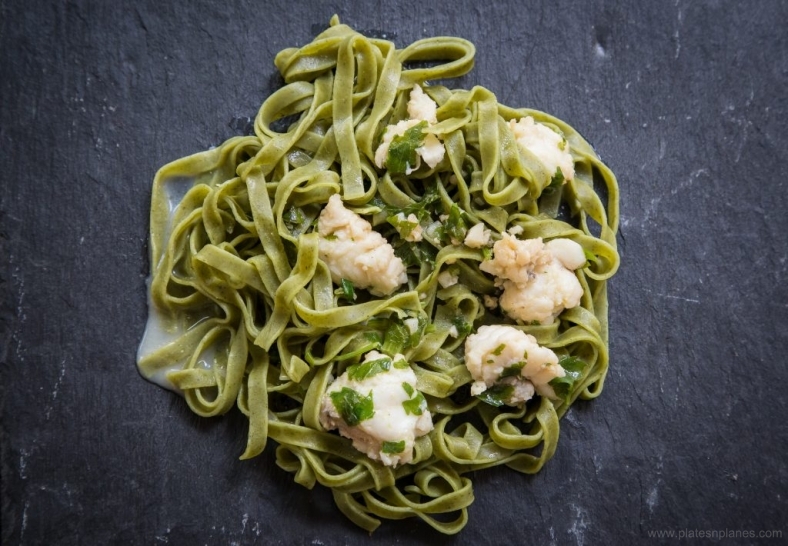 The light taste of Monkfish is accentuated with dry white vine and together with green tagliatelle makes a fragrant dish. Not only it has a beautiful balance of flavor, it is also healthy meal. 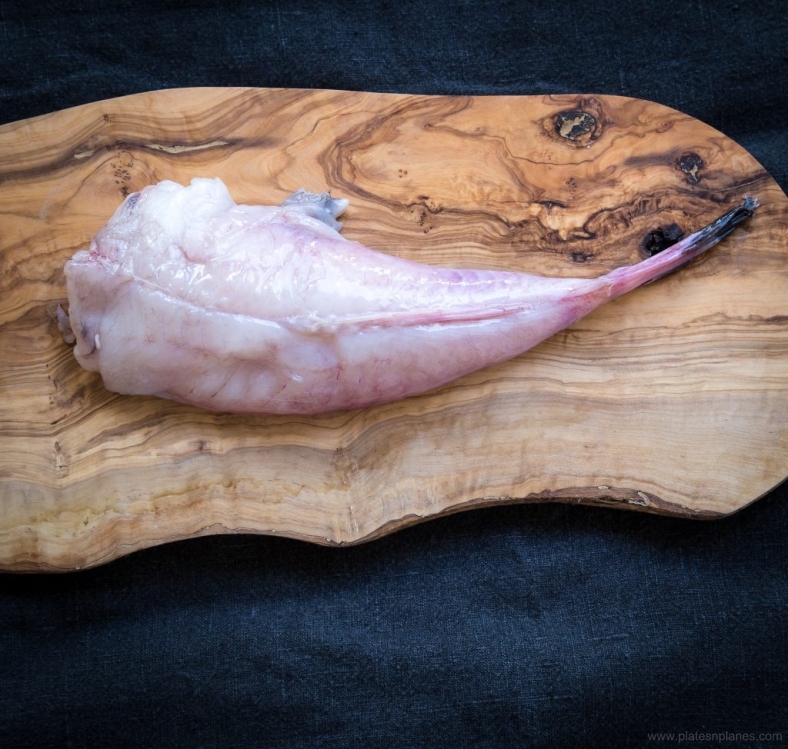 The looks of Monkfish is inversely proportional with its taste . If you translate name from Croatian language, Grdobina means ugly fish. Remove head from the tail, and clean the fish. ( You can use the head for soup or for Brodet. )Than remove the skin from the tail. Make the fillets from the tail and then cut it on cubes (3-4cm, not smaller, so it wouldn’t disintegrate during frying). Prepare a big pan, add olive oil to cover the pan and heat it on medium fire. Than add pieces of fish and fry it a bit from all sides. In the meantime in a small bowl, mix together 2 tablespoons of olive oil, parsley, minced garlic, salt , pepper. Stir evenly. Spread the mixture over the fish, stir it altogether gently until it firmly sticks to the fish. Fry for few minutes until garlic became golden, than add white vine. Cook on low fire for next 5-10 minutes. All the same time cook tagliattele. Once they are cooked, put them into a pan with fish sauce and stir gently. This straight- from- the pan-lunch is full of Mediterranean smells and flavors. Quick yet authentic Dalmatian meal is surprisingly low in fat and very satisfying. Serve it with fresh crispy Iceberg lettuce and glass of white vine.